A lot of people ask us how we define Fintech. The really short answer is “broadly”. The slightly longer answer is “the reinvention of Financial Services through digitization“. This note gives a more complete answer and defines the different categories within Fintech. Monday is when we focus on disruptive technologies such as Blockchain, AI, Semantic Web and Internet Of Things (as well as some lesser known ones). We focus on the use of technology. We are always Fin + Tech, never only Fin or only Tech. Customers don’t care about disruption – they just want better, faster, cheaper financial services which are enabled by technology. That is why the rest of the week is defined along customer-facing lines. Monday is when we translate Tech for Fin. We do not talk tech to techies. We talk to senior business people and investors (who come from many different disciplines, of which technology is only one) and explain how the technology works and why it is important for them and their market. Monday is also when we focus on strategy (for both upstarts and incumbents) and the big trends that cut across all the categories. We focus on the big changes that happen when an innovation crosses the chasm to the mainstream and what will drive that transition to mass adoption. (Note: our Authors are global in mindset and experience and travel a lot. We put the location so that you can plan calls around timezones and work out when a face to face meeting is possible). Wealth Management & Capital Markets. We define Wealth broadly as being any amount of capital, small or large, that is allocated to financial assets (private equity, public stocks, bonds, currencies both Fiat and Crypto, real estate, precious metals, art and so on). We include both short-term trading as well as long-term investment. Customers wanting their capital to grow can be passive (leaving it to professionals) or active (sending time to find assets to trade/invest). Exchanges, brokers & dealers, investment banks, asset managers, private banks, retail and commercial banks, and the entire world within and behind all these front end scenes (such as research, custody & compliance); are all serving wealth creation needs of all sorts and at all levels, ranging from millennials to corporates. Digital Wealth Management is so intrusive that in a few years we won’t be able to distinguish it from all other basic lifestyle needs. The digitization of Wealth Management affects developed societies and underserved ones. This is a massive opportunity, because banks have ignored small business for so long. Small Business is like a middle child – neither the oldest (big business) nor the youngest (consumer). This illustrates the old adage that innovation comes from those who have been excluded from the old way of doing things. Small business needs the same Corporate Finance products that big business needs (such as debt, equity, payments, foreign exchange) but to serve these efficiently to millions of small businesses requires a far higher degree of automation and different business models. The models for a small business service are just as likely to come from Consumer Finance as they are from Corporate Finance. We see InsurTech as a category within Fintech rather than separate. It is certainly viewed that way within traditional financial services where universal banks such as Citi grew out of a merger between an Insurance company and a Bank. Insurance has two sides. One side takes in Premiums and pays Claims. It is a customer service business with a focus on sales and marketing, business process management and statistical risk management. The other side of Insurance invests that cash flow to make sure they have the capital to pay Claims as needed. This part of Insurance is really part of the Digital Wealth Management category. We see innovation coming from two ends of the barbell. One end is the hyper-efficient wealthy cities and countries where digitization is driven by very high levels of consumer adoption and the cost of delivering services the analog way with a lot of labor cost. The other end of the barbell are the big population high growth countries (such as China, India, Africa) where digitization is driven by the ability to leapfrog legacy technologies and the unmet needs of these large populations. There is a lot of competition for consumers in the West. You could classify this market as the Overbanked. As an entrepreneur would you target a market that is already well served by many competent competitors? Or do you go after the billions of people who are emerging into a global middle class even if the revenue per client is tiny? We see innovation moving from one to another. Historically we have seen innovation starting in the hyper-efficient wealthy cities and countries and we expect this to continue. However a new trend which we call “first the Rest, then the West” is when innovation starts in one of those big population high growth countries and then propagates globally. 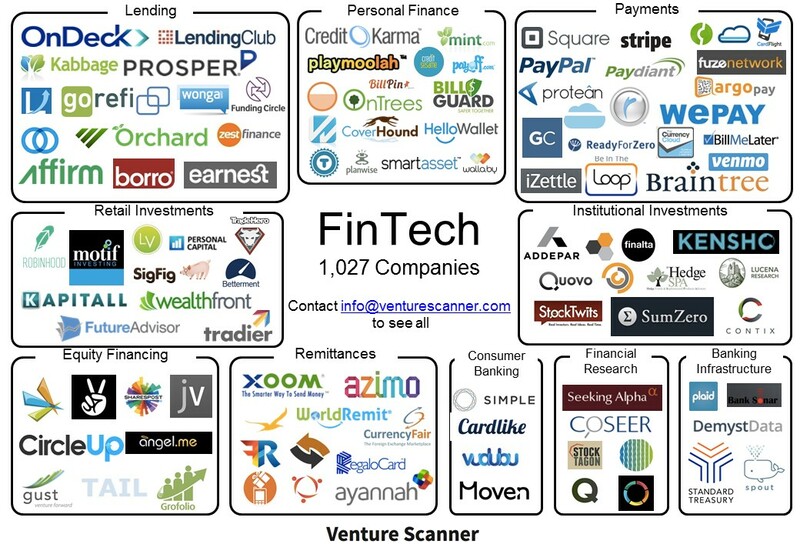 We envisage Fintech as a big ocean with a lot of fish. Fintech is big because Financial Services is a big % of GDP (e.g. 7% in USA and 10% in UK), accounts for a big % of corporate profits (as much as 40% by some estimates) and most of it (around 90%) can be delivered digitally. Fintech is an ocean, because whatever categories we define, the lines will be increasingly blurred over time and the fish (customers) will move from one part of the ocean to another, even if we can expect more of a certain type of fish in a certain part of the ocean. One of our mantras is that “bits don’t stop at historical category boundaries”. The business practices & models that evolved pre digitization defined the historical Financial Services categories. However, if you deliver value through a customer centric approach, you ignore artificially defined categories to focus on the needs of real people. For example, in the big population high growth countries, the distinction between consumer and small business is largely artificial as most people are entrepreneurs. Another example is that the investing part of Insurance really fits within Capital Markets. B. 100 people with no money or influence. The currency of the web says B is 10x more valuable than A. Our subscribers and clients know that is crazy, but we don’t have the language or metrics to describe why and how A is more valuable. We know that A is more valuable, so everything we do is designed to protect your time. Many resources, such as money, are elastic, but time is the one thing we cannot manufacture more of. That respect for your attention drives how we write and what we write about. It also explains why we don’t employ any of the normal tricks to grab your attention – all of them are as annoying as somebody at a party using a megaphone to talk to you. Daily Fintech has been writing every day Mon-Friday since 29 June 2014 (the first post is here). That is 240 posts a year and as I write we are coming up for our 3rd anniversary (when the archives will have 720 posts). As we are insight-driven not news-driven many of our posts continue to have value long after they were written. normal word search (either from a search engine or on our site). Categories (for example, all Insurance posts). Tags (the terms that end up using a lot in our posts). Related content (which you see at the end of each post). Next Can fintech impact small business loyalty programs?